Macro Musings Blog: Is There Really Excess Money Demand After All These Years? Scott Sumner told us in September 2009 that "the real problem was nominal," that is, the recession and its high unemployment were primarily due to an unsatisfied excess demand for money (combined with real effects on debt burdens of nominal income being below its previous path)...Market Monetarists who have been celebrating the Fed’s recent announcement of open-ended monetary expansion ("QE3') seem to believe that Sumner’s 2009 diagnosis still applies. But what is the evidence for believing that there is still, three years later, an unsatisfied excess demand for money? ...If the evidence for thinking that there is still an unsatisfied excess demand for money is simply that we’re having a weak recovery, then as Eli Dourado has pointed out, this is assuming what needs to be proved. Larry's question is understandable since it has been so many years since the crisis first erupted. George Selgin, Steve Horwitz, Eli Dourado, Tyler Cowen, and others have raised this objection before so it is a common one. This objection, however, is unwarranted since there is plenty of evidence that there still remains excess money demand. Before presenting the evidence, there are several points worth noting in this debate. First, there have been developments other than the U.S. economic collapse of 2008-2009 that have affected money demand over the past four years. While the 2008-20009 collapse was the most important one, there has also been the Eurozone crisis of 2010-present, the debt ceiling talks of 2011, and numerous other lesser events (e.g. robo-signing crisis) that have kept economic uncertainty peaked and thus money demand elevated. In other words, there have been a series of negative money demand shocks that have have compounded the initial money demand shock. Questioning why there hasn't been enough time to satiate money demand ignores these developments. Second, when considering money demand shocks it is important that we do so with the appropriate measure of money. Thanks to the work of Gary Gorton (2008), Wilmot et al. (2009), Sing and Stella (2012), and others we now know that what is used as money is far broader than the standard measures. The widely used M2, for example, is limited to retail money assets like cash and deposits accounts that are used by households and small businesses. Institutional investors also need assets that facilitate transactions, but the assets in M2 are inadequate for them given the size and scope of their transactions. Consequently, institutional investors have found ways to make assets like treasuries, commercial paper, repos, GSEs and other safe assets serve as their money. These institutional money assets, therefore, should also be considered part of the money supply. Thus, while M2 might reveal insights on money demand shocks for retail investors it does a poor job shedding light on money demand shocks by institutional investors. This understanding implies that the so called demand for safe assets is really demand for money assets. Interestingly, FA Hayek understood this point many years ago. Most of the growth in household's liquid assets comes from growth in saving and time deposits. As seen in this figure, the demand for these assets sharply increases with the crisis in 2008 and has yet to subside. This response makes sense since these are the highest yielding FDIC-protected money assets. Households are still demanding safe assets. This surge in money demand explains why M2 has grown so sharply recently, a development noticed by the Fed late last year. 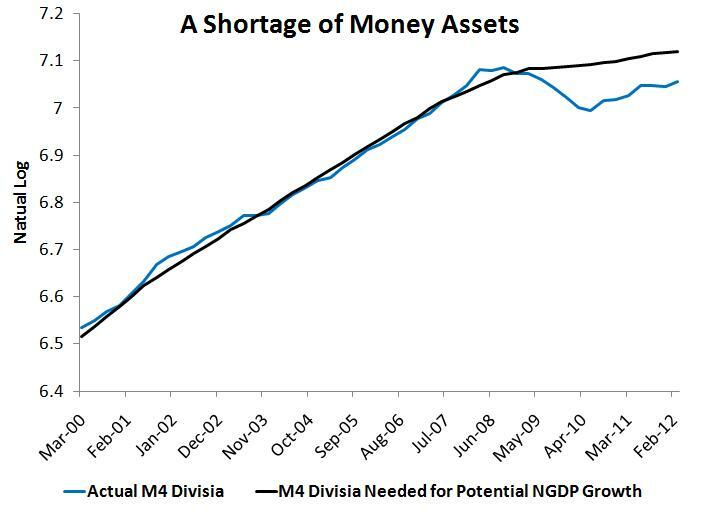 This figure indicates there is still a shortage of money assets and thus, an ongoing excess money demand problem. Finally, further evidence on excess money demand can be seen in long-term interest rates. As seen below, long-term interest rates have gone from just over 5% at the start of crisis to around 1.5%. Since the Fed is not the biggest purchasers of treasuries over this time--it is foreigners and private individuals--it cannot be the case that the Fed is an important factor pushing these rates down. Even studies that look at the large scale asset purchases attribute at most about a 1% reduction in long-term interest rates. Consequently, interest rates are low because of ongoing economic weakness that has decreased the demand for credit. Excess money demand is at the heart of this slump. If money demand were not elevated and the public expected higher nominal incomes these interest rate would be rising. The fact they haven't speaks volumes to the ongoing demand for safe assets or money. It is hard to believe we have been in this slump since mid-2008. That is a long stretch and one would think enough time for money demand shocks to work themselves out. But the U.S. economy has been subject to a spate of money demand shocks and the Fed has consistently failed to fully respond to them. This is why we have Bernanke's Little Depression. And it is why we now need a full-fledged and explicit NGDP level target. P.S. Households continue to expect their incomes to remains depressed. This is another reason to believe money demand is still elevated. "Institutional investors also need assets that facilitate transactions, but the assets in M2 are inadequate for them given the size and scope of their transactions. Consequently, institutional investors have found ways to make assets like treasuries, commercial paper, repos, GSEs and other safe assets serve as their money." That sounds like a paper waiting to be written. I linked to your post, but you should turn that into a paper and submit it somewhere. "there have been a series of negative money demand shocks." I find this language unhelpful: a "negative" demand shock ought, strictly speaking, to mean that demand for the affected thing goes down, not up. So, the "shocks" must have called for less rather than more easing. But that evidently isn't what is meant here. "Negative" apparently has not its usual sense but that of "unwanted" or "undesirable." "Institutional investors also need assets that facilitate transactions, but the assets in M2 are inadequate for them given the size and scope of their transactions. Consequently institutional investors have found ways to make assets like treasuries, commercial paper, repos, GSEs and other safe assets serve as their money"
This begs the question, for if it is these assets, rather than those found in narrower aggregates, for which there is excess demand, it is not in the Fed's power to increase their abundance. On the contrary: when it swaps FR liabilities for any of these very assets, it presumably reduces the supply of precisely those things that institutional investors supposedly have to have for their transacting! To help them, the Fed should have been doing "reverse" QE! "household portfolios are still inordinately weighted toward liquid assets. Take a look at the figure below. It comes from the flow of funds data and show households' total deposit assets and treasuries as a percent of total household assets. There is a sudden jump in this series in 2008 that has yet to return to pre-crisis levels, a sure sign of elevated money demand." An awkward claim, since the date suggest a slowdown in demand for time deposits during precisely the period--2007-209--when the "shortage" of money was presumably most acute, as evidenced by shrinking NGDP. "interest rates are low because of ongoing economic weakness that has decreased the demand for credit. Excess money demand is at the heart of this slump. If money demand were not elevated and the public expected higher nominal incomes these interest rate would be rising. The fact they haven't speaks volumes to the ongoing demand for safe assets or money." The argument here begs the question. Yes, credit demand is low; and that's because the economy is in a slump. But it doesn't follow that the slump is due to a lack of spending, as opposed to having structural or "real" causes. There is no guarantee that higher spending will lead to higher real rates, rather than simply raising nominal rates by boosting inflation expectations. "It is hard to believe we have been in this slump since mid-2008. That is a long stretch and one would think enough time for money demand shocks to work themselves out. But the U.S. economy has been subject to a spate of money demand shocks and the Fed has consistently failed to fully respond to them." The shock of 2008-9 is evident enough in the NGDP and other spending series. But the "shocks" after that do not show up in the one place that should matter most, especially to proponents of NGDP targeting. Instead all concede that NGDP has recovered its pre-2008 level and approximate growth rate; the question is whether it needs to grow faster to "catch up" to its former trend. That claim, in turn, depends heavily in how one constructs the "correct" trend, and especially on the extent to which one is prepared to allow "boom" period NGDP growth (e.g. from the dot.com and subprime bubbles)to inform estimates of "normal" trend growth. Draw the trend at 5% or more, as you and Scott prefer to do, and NGDP is "behind" where it "ought" to be. Draw it for 4.5% or less, and "catching up" looks like just the thing for blowing yet another bubble. David, thanks for spelling out the case. Unfortunately, as I'm sure you appreciate, your first chart showing actual dollar quantities of household assets does not show a gap between the actual and the desired quantity. Your second chart has more promise. It purports to show "the optimal amount of M4 divisia by plugging in potential nominal GDP (as estimated by the CBO)." I understand potential real GDP, and part of my argument was that the waste of resources in the boom lowered the path of potential real GDP. But what is "potential nominal GDP"? "This begs the question, for if it is these assets, rather than those found in narrower aggregates, for which there is excess demand, it is not in the Fed's power to increase their abundance... To help them, the Fed should have been doing "reverse" QE!" You really don't believe that because if you did then the Fed would also have absolutely no influence over any privately produced safe assets such as those in M1 and M2. As you know, the Fed can influence these monetary aggregates by managing expectations of future nominal income growth. For the same reason, it can influence the M4 aggregate. The whole point of the Market Monetarist critique is that the Fed failed to stabilize NGDP expectations. Your critique allows no room for expectations which is the centerpiece of modern macro. You both seem to be missing what the first graph is saying. It shows the %share of total household assets that are liquid. It does not show the dollar amount. The figure shows that household portfolios are unusually weighted toward more liquid assets. This share is systematically related to velocity as seen in this figure. For there to be a recovery in nominal spending this share has to come down. This is what the portfolio channel is all about. That this ratio has not come down since the crisis indicates households are still holding inordinate amount of money assets. There is no way around this interpretation. 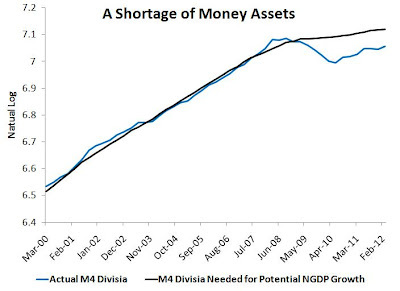 If there were no excess money demand problem, base velocity and NGDP would be higher/stronger. If this were at the same time accompanied by weak RGDP growth and high unemployment,, the supply-side structuralists would have a stronger point. But it isn't. So they don't. At least not yet. My comment about time deposit growth was off as you noted. It was all in saving deposits so I striked out the time deposit part. Nonetheless, the the bigger point still remains: household liquidity is elevated and has remained so since mid-2008. "You really don't believe that because if you did then the Fed would also have absolutely no influence over any privately produced safe assets such as those in M1 and M2. As you know, the Fed can influence these monetary aggregates by managing expectations of future nominal income growth." Oh but I do: it is literally true that if there is an excess demand for, say, Treasuries, rather than for bank deposits, the Fed could only reduce that excess by selling rather than buying Treasuries, that is, it would have to reduce the monetary base. In normal OMOs, the banks are assumed to have no excess reserves. When the Fed trades new base money for banks' non-reserve assets, the banks have excess reserves to lend. Lending and deposit growth go on until the reserves are again fully employed. That is, reservable deposits must increase until equilibrium is re-established. So the Fed is capable of increasing the nominal value of the aggregates. Of course, if excess money balances are created in the process, it may increase the nominal value of other assets as well. Nor does the Fed generally influence the nominal stock of conventional aggregates by "changing expectations" about NGDP growth. (I'm going to call this the "My Favorite Martian" view of monetary policy, with apologies to anyone under 50.) It might try doing so in the special circumstances we now face in which banks sit on huge amounts of excess reserves. But in that case, what the Fed is attempting to do is to increase the velocity of B, so banks start lending. QE doesn't do that: it reduces banks holdings of other assets and adds further to their reserves. If the assets are bad, its a bank recapitalization scheme. Indeed this is a great write-up and definitely warrants expansion into a fully fledged paper! "if there is an excess demand for, say, Treasuries, rather than for bank deposits, the Fed could only reduce that excess by selling rather than buying Treasuries"
is it not true though that an excess demand for treasuries cannot persist unless accompanied by an excess demand for money itself? I agree under normal circumstances open markets sales to clear the bond market would reduce the monetary base. But doesn't it depend on whether the excess demand for bonds is relative to g&s or to money? I think the excess demand you are describing is relative to money, in which case it must be true that excess demand for bonds relative to g&s is only possible with a concurrent excess demand for money relative to g&s. And what if bonds have been bid up to a floor rate so that money and bonds are close substitutes? Then any action that relieves the excess demand for money proper will do the same for liquid assets generally. This is a great post. I am completely on board with the description of money demand as being a safe asset demand. Very happy that you invoke Gorton and Singh/Stella as well. But you do realise that accepting this description places you firmly in the Tobin-Kiyotaki-Wright tradition of money as a portfolio asset than in the monetary disequilibrium tradition of money as a medium of exchange? "Oh but I do: it is literally true that if there is an excess demand for, say, Treasuries, rather than for bank deposits, the Fed could only reduce that excess by selling rather than buying Treasuries, that is, it would have to reduce the monetary base"
This is a static view that only is true if one ignores the expectation channel. I take the expectation channel seriously. As Woodford notes, if the Fed can signal its actions--the OMO here--will lead to a permanent increase in the monetary base in the future than this increases demand for credit today. That in, turn, would catalyze increased private production of safe assets. Nor does the Fed generally influence the nominal stock of conventional aggregates by "changing expectations" about NGDP growth... It might try doing so in the special circumstances we now face in which banks sit on huge amounts of excess reserves. But in that case, what the Fed is attempting to do is to increase the velocity of B, so banks start lending." The Fed only increase B velocity today by changing expectations about the future path of nominal income and prices (which implies it changes expectations about the future size of the monetary base) The simple money multplier story you invoke assumes the Fed can "push" it out. I see the evidence for the the public "pulling" it out in response to the Fed changing expectations. Bringing this back to the main point, contrary to your claim the Fed certainly can influence the creation of institutional money assets by changing expectation about the future path of the monetary base. is there no way for me to have one foot in both camps? David, you wrote that I "seem to be missing what the first graph is saying. It shows the %share of total household assets that are liquid. It does not show the dollar amount. 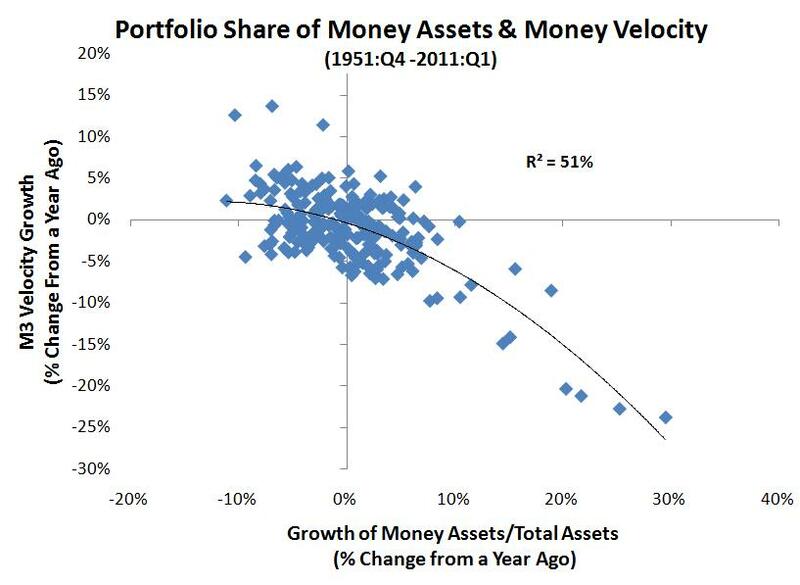 The figure shows that household portfolios are unusually weighted toward more liquid assets." You are right that your first graph shows a ratio of two dollar amounts, not the amounts themselves. My misstatement. But my point still remains: the graph shows the actual ratio, not a gap between actual and desired. It isn't evidence of a disequilibrium. "For there to be a recovery in nominal spending this share has to come down." That is simply not true. Keep the ratio the same but expand the nominal money supply enough, and nominal spending will rise to any extent desired. I don't understand why you think otherwise. "That this ratio has not come down since the crisis indicates households are still holding inordinate amount of money assets. There is no way around this interpretation." That the ratio has not come down indicates that households are holding current higher ratios than their pre-crisis ratios. How do we know that they are not now satisfied? How do we know that they want to hold still higher ratios, but are somehow being frustrated? I would also be grateful if you could explain "potential nominal GDP" to me. Thanks. Keep the ratio the same but expand the nominal money supply enough, and nominal spending will rise to any extent desired. I don't understand why you think otherwise. Because standard portfolio theory and evidence says otherwise. This ratio shows the proportion of HH assets the are liquid. Thus, the higher demand for liquid assets the greater the ratio will be and vice versa. For example, if HH see greater economic uncertainty ahead and their demand for liquidity increases,they would increase their holding of liquid assets and this ratio would increase. That is why this ratio soars in 2008. If,as you suggest, the Fed were to significantly increase the monetary base such that nominal spending soared this ratio would not stay constant. This rise in nominal spending would raise expected future nominal incomes and returns. Households, therefore, would readjust their portfolios away from low yielding, liquid assets to higher yielding, riskier assets. This portfolio rebalancing would in turn lead to a further increase in current nominal spending through balance sheet and wealth effects. There is ample empirical evidence for this ratio being systematically related to changes in nominal spending. This figure link I gave in my last reply makes the point clear. More formal analysis can be found in this paper by Josh Hendrickson and me. We find systematic evidence over a long sample that changes in this ratio have a large impact on nominal spending. This portfolio rebalancing and its importance can be seen in this figure that shows the relationship between the stock market and expected inflation from TIPs. Whenever expected inflation has risen, it is implied that investors are shifting out of liquid assets and into riskier, higher yielding equities and vice versa. Though this figure captures more than just household investors, it shows share of portfolios allocated to liquid assets matters. That this ratio has not come down is one reason why there has not been a full recovery in nominal spending. Larry, the CBO says that it constructs nominal GDP by multiplying real GDP by the GDP price index. For example, if HH see greater economic uncertainty ahead and their demand for liquidity increases,they would increase their holding of liquid assets and this ratio would increase. That is why this ratio soars in 2008. Actually, I'd say the real reason the ratio soars in 2008-09 is because stock prices plunged, not because of actual household actions to switch into deposits. Incidentally, the surge in savings deposits comes after the plunge in nominal spending, not during the the NGDP contraction. Household asset allocations are in fact a poor proxy for nominal spending patterns for two reasons; the first, as I mentioned earlier is related to the fact that the household asset ratio can shift without any change in aggregate household behavior because of fluctuations in asset prices (like the 2008 stock panic or the 1990's bull market). Secondly, it is well known that retail investors are excellent contrary indicators. They seek safe assets and eschew risk assets after the bear market is over. From a contrary standpoint, it is no surprise to see continued household accumulation of savings deposits and bond funds even as most stock markets recently reached their highest levels since 2Q 2008 (and the Russell 2000 small-cap made an all-time high). "Larry, the CBO says that it constructs nominal GDP by multiplying real GDP by the GDP price index." So does the GBO then "observe" real output directly, that is, without reference to a deflator, by counting sides of beef, barrels of oil, numbers of automobiles, apples, oranges, etc., and aggregating them all somehow? Maybe the GBO imagines that it does this. But if so then the GBO doesn't actually know what it's about.